Janet and her husband Brian Charles came to Box recently, brought by their son John. They turned up on spec with little more than an old family photo (above) and the name of the area where Janet's grandmother lived in Box. She came from The Old Jockey area, married locally but later left for Whitley, Atworth. Old Jockey House in Janet's photo looks much the same today but there are subtle differences. Three first floor windows on the right had top blinds and bottom lace nets but the two on the left had only blinds. The front door looks very imposing as if it was never opened. This was because it blocked the entrance to two separate residences in the property, one accessed by stairs going up after the entranceway and the other accessed through back stairs. The arrangement with two staircases was common in the late Victorian period, the front stairs for the family to use to access their rooms and the back one for servants to go straight up from the kitchen to their attic accommodation. These weren't the only stairs in the building. When the building was a pub the basement also had stairs which could only be entered via the back stairs. For many years, a horse mounting-block existed outside just to the left of the front door. There appears to be considerable building work going on at Old Jockey Farm seen in the background where a wall has been demolished and rebuilt. The Clarke family took over the house as a farm in 1909 and we might imagine that the work took place shortly before their arrival to allow access to farm carts on a through-route in front of their house. The photo shows four individuals: Janet's grandmother Lucy Ella Franklin holding a small baby standing behind a matriarch in black and another young woman on the right. The matriarch was Lucy Matilda, Lucy Ella's mother, who lived in the house for a number of years. Her husband Henry John Franklin had died tragically, killed in a quarry in 1895, his body brought home on a sheep's hurdle. Lucy Ella was 11 years of age and stayed home to help her mother raise her big family: 14 children in all, 12 of whom lived to adulthood. Dorothy Evelyn, was born in 1906 and the photo appears to have been taken soon after then. Probably the other young woman shown was Lucy Ella's sister, Eveline Augusta, who married Samuel Marshman in 1911 and moved away. The family are shown on one side of the building because they occupied only the right hand side of the property. Lucy Ella's older brother, Harry George, was a traction engine driver who had a serious accident, necessitating a wooden leg when a steam roller went over it in about 1901. He never returned to his job and his younger brother took over his employment as a Steam Roller driver. Harry George became a gardener, working at an unidentified big house in Box. He was still living in the right-hand side of Old Jockey House in 1939. The photo left is believed to be Lucy Ellen's brother David Herbert Franklin, who married and lived at Fairford, Goucestershire, where he worked as a postman. His story was given in Franklin Family. We only know a little about other Franklin family members. Lena Franklin lived at a Golf Club in Scotland and Arthur Franklin lived at Batheaston. The Franklin's neighbours on the left in 1901 were Albert and Anna Smith and in 1911 Sidney and Lucy Ella Sheppard. These two families were connected because Anna Sheppard (b 1869) married Albert Charles Smith in 1887. On their relocation to Holt, Anna's younger brother Sidney (b 1880) took over the property. It was Sidney who married Lucy Ella. Sidney and Lucy stayed locally and, for a while, they lived just around the corner of the same hamlet at Jefferies Cottage. It was a comparatively easy house move because all the properties were rented from the Fuller estate of Corsham and the families were known to be reliable tenants. Sydney worked at the Avon Rubber factory in Melksham and they moved there to be closer to work. Katherine Harris, tells how the family had a lean-to extension at the back as a scullery for heating water and doing the washing, which had a rear doorway always used to enter into their part of the property. The front door became permanently shut. Mr Bird was a roadman, doing council repair work. They had two sons of their own and adopted three girls by the name of Day, partly to supplement their income. The Birds still lived there in 1939 with one son Roland. The photographs below of my Grampy Sidney Sheppard show him (left) as a soldier in World War 1. I don't know his regiment unfortunately, but it could have been the Royal Engineers. After the war, Sid had bad rheumatism and was in the Rheumatic Hospital, Bath, for a long period. The photograph (right) shows him as an elderly man, just as I remember him, working in his garden at 133, New Buildings, Whitley, opposite the Pear Tree Pub. The photographs below show the children of Sidney and Lucy Ella: Below left Dorothy Eveline Sheppard (Yates) born 16 June 1906; Below centre the three brothers, seen left to right: Sidney George Sheppard, born 14 January 1910, Frederick David Sheppard, (my Dad), born 4 July 1908, and Walter Cyril (Wally) Sheppard, born 4 June 1912. Seen Below Right: Irene Kathleen Sheppard (Beard) born 18 June 1920. Dorothy Evelyn Sheppard, the baby shown in the headline photograph, grew up to marry Walter William Yates in Devizes in 1928, seen in the wonderful photograph below. Janet's father, Frederick David, was born in 1905 and went to Box School. You can see him in the photograph below standing third from the left by the windows in the front of the boys' school. His brothers are also in the picture: Sydney George is second from the right in the front row and Walter Cyril Sheppard is third from the right in the front row. The teacher in the centre of the photo is believed to be headmaster Harry Tinley, the only known photo of him. Janet's husband Brian had another fascinating history to tell as he had been sent to France to live with an aunt in the years running up to the Second World War. Unable to come back because of the fighting, he was taken to be a French boy by the invading German army and imprisoned in a detention camp and given a German nationality and passport, believed to be the only living British person to have done so. He survived the war and only returned to England and his parents after hostilities ceased. When they came to the door of our house, I was sure that I recognised John, so I asked "Do you live in Box". The answer was that he had been in Australia for the last 28 years but I was still uncertain until Janet said that I might have seen him on television as he had just completed the Clipper Round the World Yacht race despite serious injury on the journey in 2016 on the yacht "Great Britain". He returned to complete the trip in 2017 on "Dare to Lead". Well, it is a small world, isn't it? Lena Franklin who lived at a Golf club in Scotland. In 1899 the Franklin family lived at The Old Jockey but not in Old Jockey House, probably in Jefferies Cottage. 1901 the family lived next door to the Smith family at 2 Old Jockey. They were still there in 1911. Thomas Sheppard, farm labourer later a shepherd, was married to Fanny Wilmot. Children included Sidney (1879 - 1969), who sometimes spelt his name Sydney. 12 June 1905. Their marriage was witnessed by Beatrice Edith Huband Gale (1875 - 1939) and William James Kingcott Franklin. 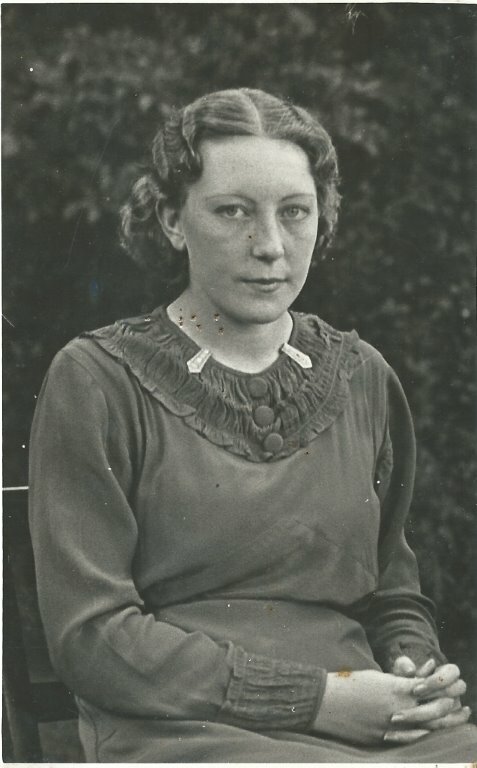 Irene Kathleen Sheppard (Beard) (born 18 June 1920).